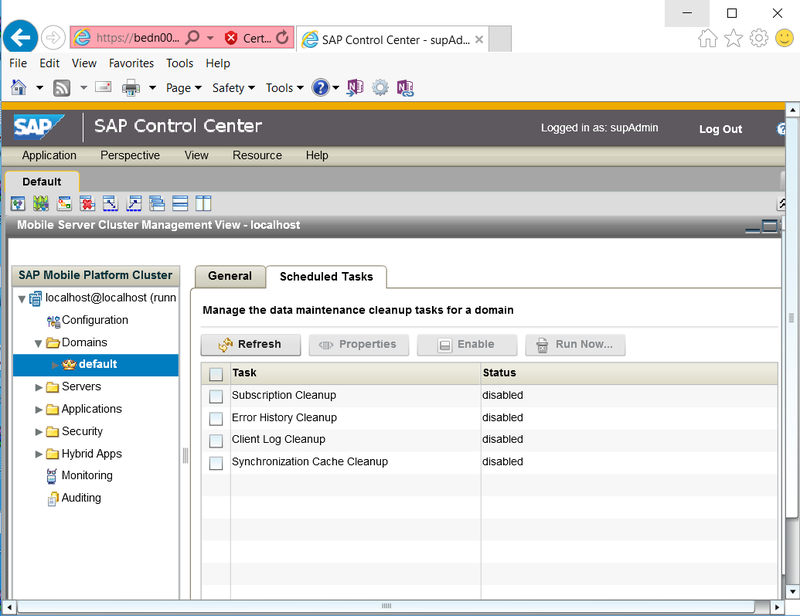 SMP 3.0 setting up Scheduled Tasks in SAP Control Center and Domain Log cleanup. 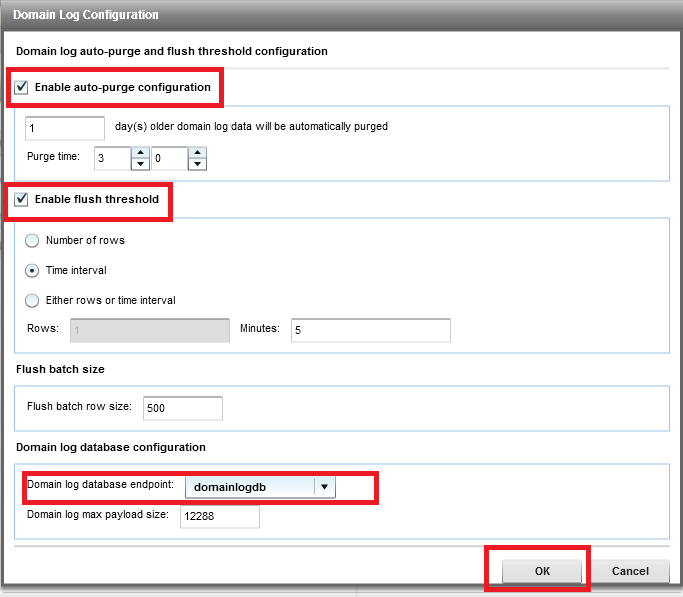 This technical document explains how configure the four SAP Control Center Scheduled Tasks and Domain log cleanup in order to keep SAP SMP 3.0 clean and manageable. SAP SMP 3.0 or higher. 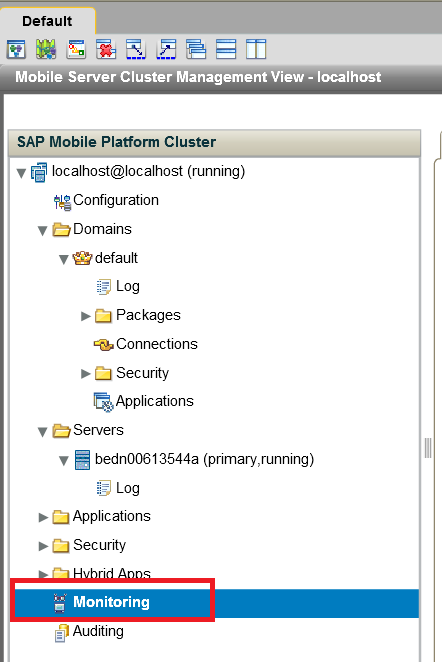 This document assumes you have a working SAP SMP environment. You need to have access to the Admin role. You need to understand each role the schedule task perform and their impact. day processing of data and user are recorded in SMP MBO server will be collect there is a lot of historical data over time would need to be clean out. For example logical deletes. Also users registering and unregistering will also be collected and stored in the database and in the log file. So it is very important to run the schedule on a daily basis to minimize the overall growth of the logs and databases. Setup schedules Task cleanup to refresh the logs and remove Logical deletes from the database. The combination of all the Schedules are required in order to clean the database and log files. Subscription Cleanup: Is used for removing device user that no longer using the system. Use caution when enabling or running this task. If an active user has not logged in within the time you schedule for the users will be removed. Make sure all the users have connected and processed before running this task. The task handles the devices differently for example. Messaging based Removes Subscription if unwired Server has not received a Synchronization message since the given date in the schedule. Replication based Removes Subscription not used since the last Synchronization. Let’s get start with the configurations. 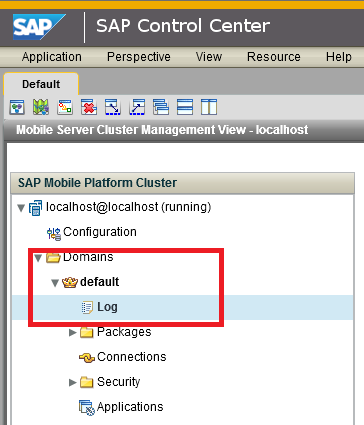 Open the desktop icon for SAP SMP Control Center. Login (default user ID): supAdmin. cPassword (default password): s3pAdmin (default). You should see the following screen below. Click on the default crown. Click on Scheduled Tasks tab. The default setting are disabled, we will walk thru each on and setup a schedule and enable them. 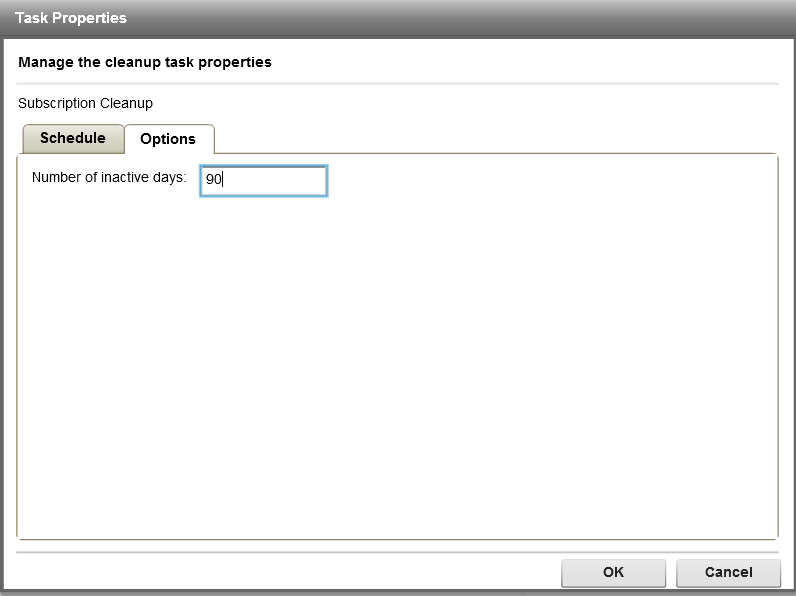 Place a check in Subscription Cleanup box then Select Enable Button. A pop dialog box will ask you if you want to enable click YES. Once enabled then Select Properties Button. 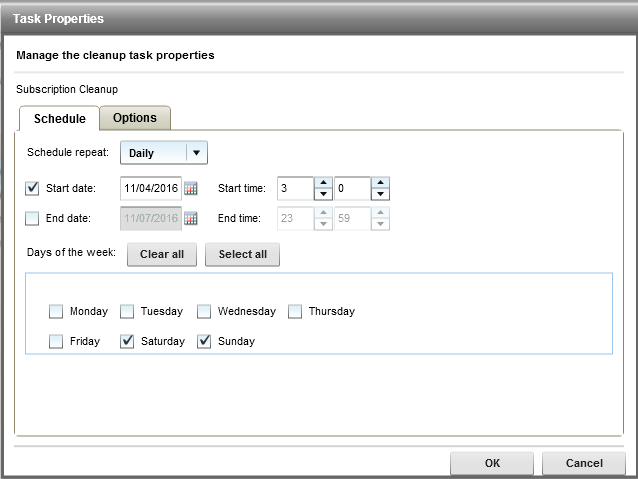 In the task properties select schedule Tab. Here we need to set our start time and the days we want to run the cleanup operation. Days of the week click Select all button. We select the Start date and set the start time. There is no need to select the End date or end time as we want this to never stop want to have end time until we want to stop it. Ideally we would like to run the schedule every day but we have to consider how it will impact performance in production. So at first it is best practices to run the schedules off peak time or on weekends. Next Select the Option Button. There is a safety day count build in the threshold is seven days so if the Admin sets the value to 30 we automatically add on 7 days. The delete operation will execute 30+7=37 days this is to give the system some space for users that may be within a few days of 30 days they may sync within say 31 days or 32 days this is done to protect the users so they are not impacted. Set the value or take the default and select OK. This completes the setting up Subscription Cleanup steps. Is used for removing historical data on an MBO data refresh and operation replay failures Caused by Network failures, System failures, user log in issues and back end data base issues. Place a check in the box for Error History Cleanup. A POPUP dialog box will ask you if you want to enable click YES. Select the Sart date and add you start day. Days of the week select Saturday and Sunday. Number of days to preserve default 7. Take the default of 7 days. This completes the configuration for Error History Cleanup. Is used for removing client log records that have already been synchronized to the device and are no longer associated with any active user. Place a check in the Client Log Cleanup. The dialog box will popup asking you if you want to enable this task click YES. Check the start Date and the start time. 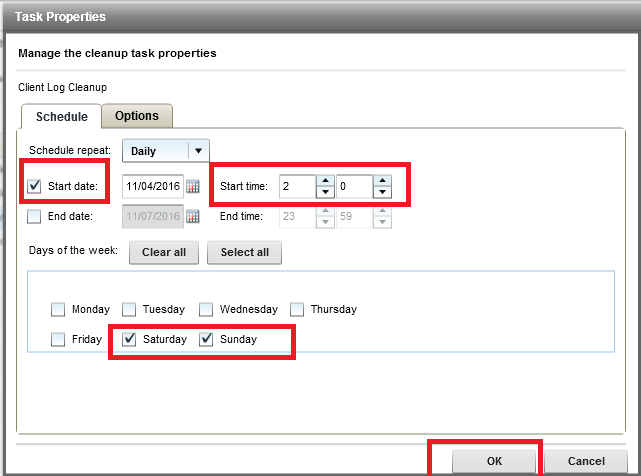 Select the days you want to run the schedule in this example Saturday and Sunday. Next select the Options tab. Number of days to preserve the log record the default 7. Take the default of seven days. This completes the configuration for Client Log Clean up. 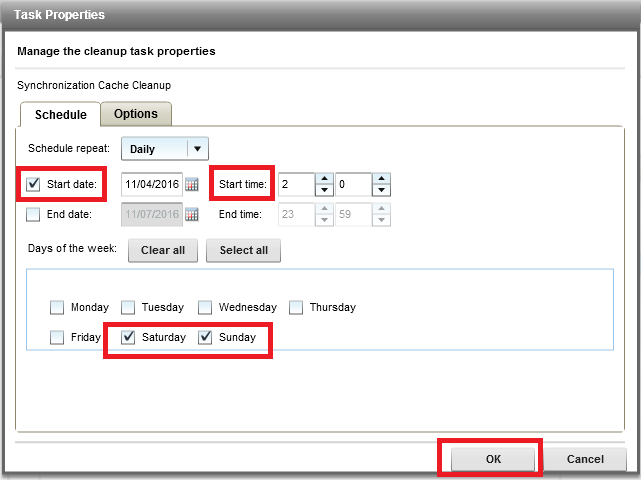 Steps – 4 Synchronization Cache Clean up. Is used for removing logical deleted rows in the cache that are older than the oldest synchronization time on a record in the system it also cleans up unused and stale partitions. 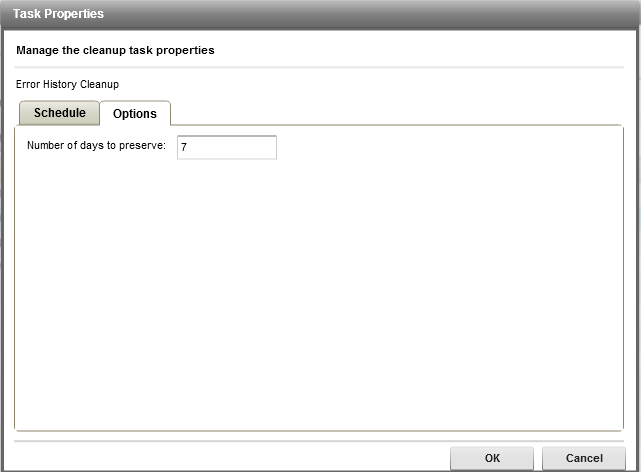 Place a check in the Synchronization Cache Cleanup. You will get a popup dialog box to confirm that you want to enable the task Click YES. Next Click the Properties Button. Select the Start date and the Start time. Next we select the days in this example Saturday and Sunday. Next we select the options tab. We can leave the Purge interval for the EIS to their respective defaults. You are now done configuring the Synchronization Cache Cleanup. It is highly recommended to run the schedules once a week during off peak hours if possible. It is also important to understand that all of the schedule task needed to be enables due to the fact that each schedule has a target areas to clean there for they all need to up and running. 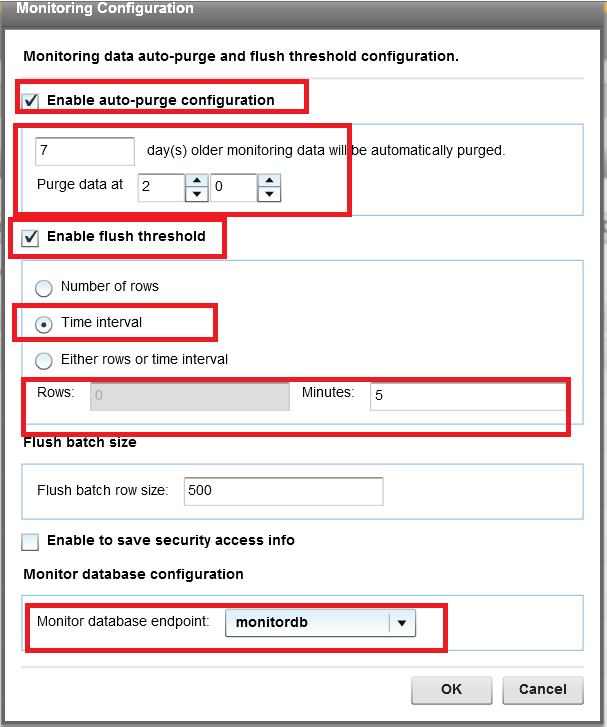 Domain Log Auto-purge and flush threshold configuration. In order to keep the SMP’s domain log clean and manageable we need to enable and set the Domain log auto purge. First go to the default and open the view directly below the SMP domain you will see the log. Select or highlight the log. On the right hand side go to the settings tab. Make sure the Domain Log Database endpoint is select. Logon to the SCC and go to Monitoring. Next on the left hand side select the General TAB then select Configuration button. Next set the days or leave the default of 7 days is fine. Make sure the Monitor Database enpoint is selected monitordb. NOTE if you select any other database will cause an error. 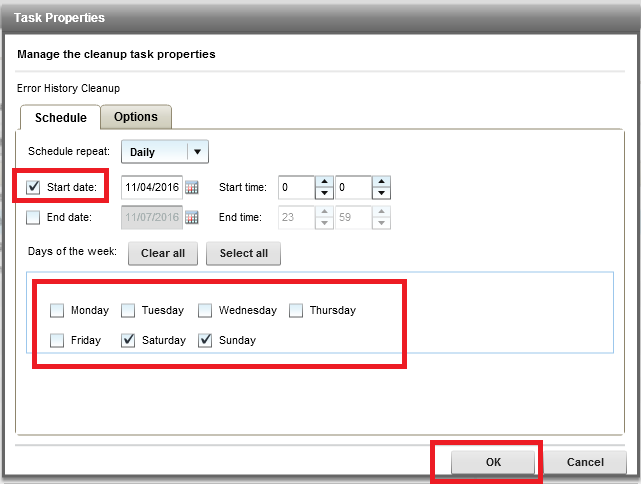 This document explained in details about the steps needed to enable Schedule task and the Domain Log clean up for SAP MBO Server. Each task will help ensure the cleanup of old data that is no longer needed and keep the logs to a manageable size. The main consideration is enabling the schedule and domain log cleanup. This needs to be done on day one of the installed produce so not to have a large amount of data in the logs and database. If not enables it will take a very long time to clean up the logs and databases of the old data. The overall size of the logs and database will not shrink. What will happen is white space or blank pages will be in the database. They blank pages will get reused over time. Also if you perform a dbunload and dbload you can also claim the empty pages in the database.